As I read this chapter, it is very apparent to me that Cecil Murphey is humble. How refreshing! He says that some of us have the innate ability to write words--they flow from us. We are able to express our thoughts easily and from our own style and personality. Others, he says try to write and may do so reasonably well, but their prose never have what he would call the "ring" or sound of quality. This reminds me of when I first tried my hand at writing, it was for a friend that was starting up a small magazine. She read my material and helped me with the grammar and said that I was a diamond in the rough. Well, that was about 12 years ago and I am still very much a diamond in the rough! Still needing that extra eye to check on my grammar. For me I just want to sit and write, letting the words flow from my mind and onto the paper. I write what is on my heart, I then save it, step away from it, then go back and check my writing. I check to see if this was my heart speaking or my head. Is what I am writing the real truth, my truth or a half truth? Big difference at times and one way to stay humble myself. Cecil writes, "You may not know if you're gifted because it's usually a matter of self-discovery. If you have that ability, you'll improve as you work at the craft--and you'll probably want to improve. If it's not a talent, you'll plateau so that your writing will remain about the same year after year. Or you'll grow weary and quit. If you believe you have a gift to write, consider it the foundation on which you build. You still need to learn the skill to express what you want to say. Polish your grammar, learn good sentence structure. Those aren't automatic or part of the Divine endowment: they're the skills gifted writers work to acquire". Once again Cecil reaffirms,"Write to find out who your are. Learn to feel your pain, write through your angst, grow through the lofty and low experiences and --if you stay at the craft--see it as an opportunity to enrich others". 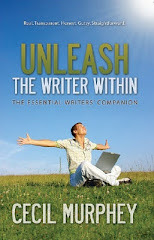 Among other things that Cecil goes on to write in this chapter is, "The type of writing you do isn't crucial; it is essential that you discover the areas that touch your passion". I find that encouraging. My advice to you as one fellow writer to another is no matter whether you write poetry, recipe books, blogs, or write songs I want you to be encouraged to start today. You don't have to be perfect. Trust that you will grow word by word, line by line,... lyric by lyric. Cecil finishes off this chapter with another Aphorism. He writes, "I write because it's my gift. The more I write, the more I know who I am"
Aphorism #2 - "I write because it's my gift. The more I write, the more I know who I am."